Dulaglutide is a recombinant glucagon-like peptide-1 immunoglobulin G4 Fc fusion protein approved for treating patients with type 2 diabetes (T2D). The aim of this study was to assess postprandial data over 4 weeks for dulaglutide (0.75 mg) versus placebo after a standardized test meal in Japanese patients with T2D. 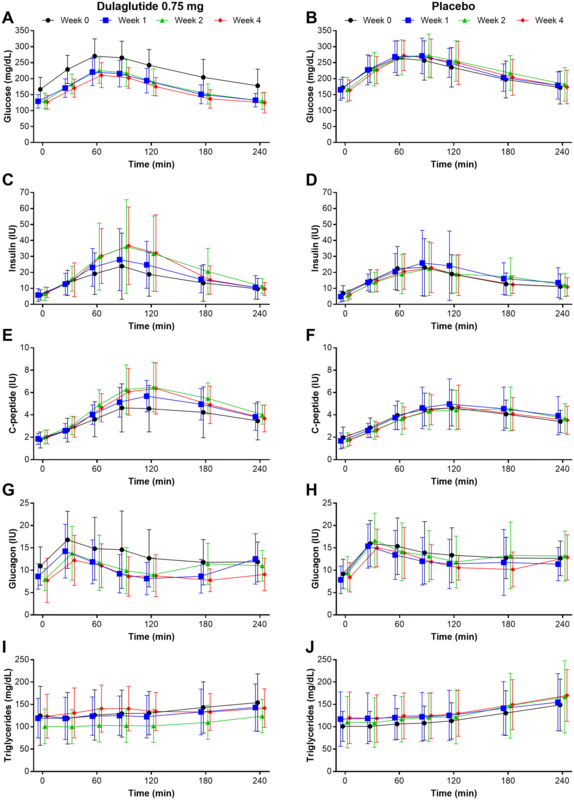 The pharmacodynamic (PD) effects of once-weekly dulaglutide (0.75 mg) in Japanese patients with T2D on diet and exercise therapy (N = 12) were evaluated by assessing postprandial data up to week 4 in a phase 4, single-center, randomized, cross-over, single-blind, placebo-controlled study. The primary end point was the change in 4-h glucose area under the concentration versus time curve [AUC (0–4 h)] from baseline to week 4. Secondary end points included changes from baseline in other PD parameters (insulin, C-peptide, glucagon, and triglycerides) at weeks 1, 2, and 4 and the safety and tolerability of dulaglutide 0.75 mg. Continuous glucose monitoring (CGM) during the 1st week was performed as an exploratory measure in each treatment period. The decrease in AUC (0–4 h) from baseline to week 4 following dulaglutide administration was statistically significant compared with placebo at weeks 1, 2, and 4 (P < 0.0001). Insulin and C-peptide levels were also significantly increased (P < 0.05) with dulaglutide versus placebo at weeks 2 and 4. There were no statistically significant differences between groups in glucagon and triglyceride levels. Daily average glucose concentrations were decreased on the day after the first administration of dulaglutide and remained at similar levels for 4 days. The incidence of treatment-emergent adverse events was slightly higher with dulaglutide versus placebo. In conclusion, dulaglutide decreased postprandial glucose from week 1 in Japanese patients with T2D, indicating that dulaglutide treatment is associated with favorable PD effects soon after treatment begins. Eli Lilly Japan K.K. (Kobe, Japan). To view enhanced digital features for this article go to https://doi.org/10.6084/m9.figshare.7862279. The online version of this article ( https://doi.org/10.1007/s13300-019-0605-7) contains supplementary material, which is available to authorized users. Dulaglutide is a recombinant glucagon-like peptide-1 (GLP-1) immunoglobulin G4 Fc fusion protein  approved worldwide as a long-acting GLP-1 receptor agonist for treating patients with type 2 diabetes (T2D) . Approved doses of dulaglutide are 0.75 mg and 1.5 mg in most countries and 0.75 mg in Japan . According to the US prescribing information, dulaglutide should be initiated at 0.75 mg subcutaneously once weekly and can be increased to 1.5 mg once weekly for additional glycemic control . The pharmacodynamic (PD) effects of dulaglutide have been assessed in several studies in the US [4, 5] and Japan (Eli Lilly and Co., unpublished data). In a global phase 3 study (AWARD-3), dulaglutide 0.75 mg and 1.5 mg were found to improve postprandial glycemic control (after a standardized test meal) at 26 and 52 weeks . In global  and Japanese (Eli Lilly and Co., unpublished data) phase 1 studies, several doses of dulaglutide were found to improve postprandial glycemic control (after a standardized test meal) as early as 2 days after a single dose; however, none of the studies investigated the profile of the PD effects during the first few weeks on dulaglutide at 0.75 mg. Such information would be of interest, from a clinical standpoint, as a reference for the evaluation of dulaglutide’s onset of efficacy at the approved initial dose. Therefore, the aim of this study was to assess postprandial PD data over 4 weeks for dulaglutide (0.75 mg) versus placebo after a standardized test meal in Japanese patients with T2D. Patients included in the study had T2D for at least 1 year, had received diet and exercise therapy, and had not taken antihyperglycemic medication for at least 3 months prior to the first visit. Patients were also required to have a fasting blood glucose concentration ≥ 120 and ≤ 200 mg/dl and body weight ≥ 50 and ≤ 80 kg. Patients who had previously received dulaglutide within the 3 months prior to screening, or those who had clinically significant cardiovascular disease, liver disease, renal disease, or malignancy, were excluded. The study protocol was approved by the Hakata Clinic Institutional Review Board. All procedures performed were in accordance with the ethical standards of the Hakata Clinic Institutional Review Board and the 1964 Helsinki Declaration and its later amendments or comparable ethical standards. Informed consent was obtained from all participants included in the study. 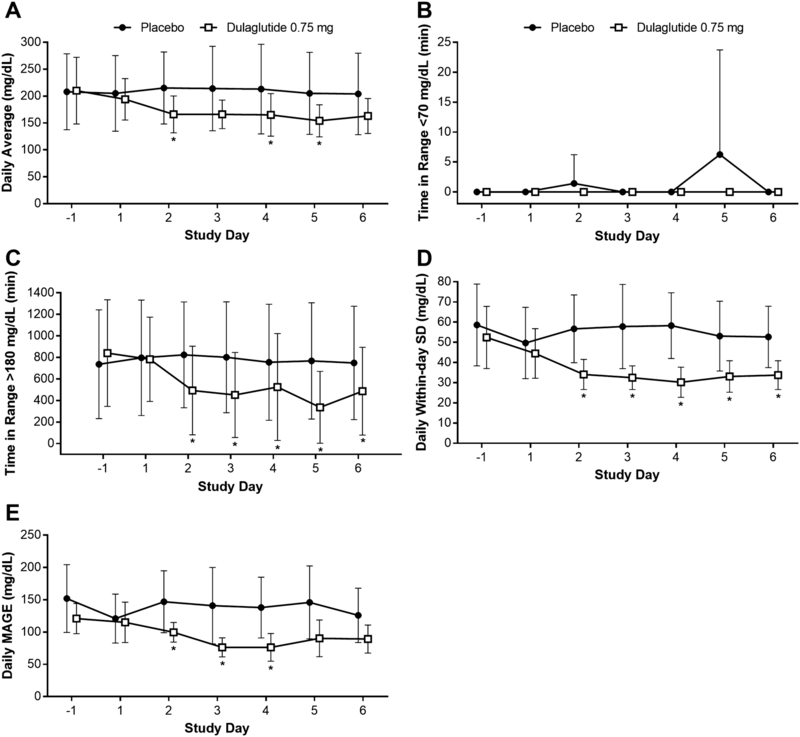 This phase 4, single-center, randomized, cross-over, single-blind, placebo-controlled study (NCT03315780) evaluated the PD effects of dulaglutide (0.75 mg/week) after a standardized test meal over 4 weeks in Japanese patients with T2D. The first patient was enrolled in the study on 28 October 2017 and the last patient completed the study on 28 February 2018. Patients were randomized, using a randomization table, 1:1 to one of two treatment sequences: placebo for 4 weeks followed by dulaglutide 0.75 mg for 4 weeks, or vice versa. Both treatments were administered by subcutaneous injection using single-dose pens that, to facilitate patient blinding, were identical in packaging and appearance. There was a washout period of 4–6 weeks between the two treatment periods (Fig. 1). A Japanese standardized test meal (486 kcal, carbohydrate: protein: fat = 2.8:1:1) was provided at weeks 0, 1, 2, and 4 (0, 1, 2, and 4 weeks after starting study drug treatment in each period) following an overnight fast. The meal, provided at approximately 10:00 a.m., comprised rice (176 kcal), one boiled egg (106 kcal), and fish in a sauce with sweet potato, kelp, and tofu (205 kcal). Blood samples were taken pre-meal and 30, 60, 90, 120, 180, and 240 min post-meal to determine serum glucose, insulin, C-peptide, glucagon, and triglyceride concentrations. The primary end point was the change in 4-h glucose area under the concentration versus time curve [AUC (0–4 h)] from baseline to week 4. Secondary end points were the changes from baseline in other PD parameters (insulin, C-peptide, glucagon, and triglycerides) at weeks 1, 2, and 4 as well as the safety and tolerability of dulaglutide 0.75 mg. Continuous glucose monitoring (CGM) during the first week was performed as an exploratory measure in each treatment period. Glucose and triglyceride levels were measured by enzymatic assay (Iatro LQ GLU and TG II, respectively; Mitsubishi Chemical Medience, Tokyo, Japan). Insulin and C-peptide levels were measured by chemiluminescent immunoassay (Architect insulin assay and Abbott C-peptide assay; Abbott Japan Co., Ltd, Tokyo, Japan). Glucagon was measured by sandwich enzyme-linked immunosorbent assay (Mercodia glucagon ELISA; Mercodia AB, Uppsala, Sweden). The FreeStyle Libre Pro (Abbott Japan Co., Ltd) was used to monitor glucose levels during the first week from the day before the first administration of the study drug until 5 days after the first dose for each period. Glucose levels were recorded every 15 min. Note: patients were blinded to glucose levels with this monitoring system. Assuming 1 dropout, a sample size of 11 patients would provide 93% power to demonstrate superiority of dulaglutide over placebo. This computation assumes the true treatment difference in the change from baseline (week 0) in glucose AUC (0–4 h) at week 4 is 190 mg h/dl, a common standard deviation (SD) of 140 mg h/dl, intrapatient correlation of 0.3, and a one-sided significance level of 0.025. The PD parameters from weeks 1, 2, and 4 were analyzed using a mixed-effects linear model. The PD parameters for glucose, insulin, glucagon, C-peptide, and triglyceride AUC from pre-meal to 4 h after starting consumption of test meals [AUC (0–4 h)] were calculated (SAS version 9.4). The model included treatment, sequence, week, and treatment-by-week interaction as fixed effects, baseline as a covariate, and patient as a random effect. Baseline was the pre-dose value at week 0 for each treatment period. Differences in least square means of dulaglutide versus placebo and 95% confidence intervals (CIs) were tabulated. The arithmetic means (± SD) by treatment group were calculated and plotted. For CGM, the daily average glucose concentration, SD, mean amplitude of glycemic excursion (MAGE), time glucose concentration was < 70 mg/dl, and time glucose concentration was > 180 mg/dl were summarized and compared between dulaglutide and placebo by paired t test. The frequency of treatment-emergent adverse events (TEAEs) was summarized by treatment, Medical Dictionary for Regulatory Activities version 20.0 system organ class, and preferred term. A total of 12 patients were randomized and completed the study; demographic and baseline characteristics are summarized in Table 1. From week 1 through week 4, mean glucose concentrations were consistently lower after treatment with dulaglutide versus placebo (Fig. 2). The reductions in 4-h glucose AUC (0–4 h) from baseline were statistically significant for dulaglutide versus placebo at weeks 1, 2, and 4 (P < 0.05) (Table S1). With respect to insulin AUC(0–4 h) and C-peptide AUC (0–4 h), a statistically significant increase (P < 0.05) was observed for dulaglutide versus placebo (Fig. 2, Table S1). There were no statistically significant differences between treatments in AUC (0–4 h) for glucagon AUC (0–4 h) or triglycerides (Fig. 2, Table S1). Daily average glucose concentrations were decreased on the day after first administration of dulaglutide (day 2) and remained at similar levels for 4 days (Fig. 3a). Patients treated with dulaglutide did not experience blood glucose levels < 70 mg/dl (Fig. 3b); in fact, there was a trend for a shorter duration of blood glucose > 180 mg/dl with dulaglutide compared with placebo (Fig. 3c). In addition, there was a trend for blood glucose concentrations to be less variable following dulaglutide versus placebo, as indicated by lower within-day glucose variability (SD and MAGE) from day 2 onwards (Fig. 3d, e). There were no clinically meaningful differences in the incidence of TEAEs following administration of dulaglutide compared with placebo (Table 2). In this study, administration of once-weekly dulaglutide 0.75 mg resulted in statistically significant reductions in mean changes in glucose AUC (0–4 h) from baseline to weeks 1, 2, and 4 compared with placebo. These results are consistent with previous reports in which blood glucose-lowering effects of dulaglutide 0.75 mg were confirmed in Japanese patients with T2D [3, 6, 7, 8]. 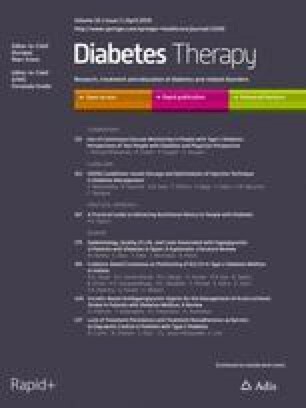 This is the first study to show a statistically significant reduction in blood glucose levels at week 1 in patients with T2D after administration of once-weekly dulaglutide 0.75 mg. Also, based on the CGM data, statistically significant reductions in the daily average glucose level were confirmed on day 2. This suggests that the exposure to dulaglutide 0.75 mg achieved an effective concentration by the day after the first dose. In general, Japanese patients with T2D are relatively leaner and have lower insulin secretion compared with Western patients. As a result, postprandial glucose levels in Japanese patients tend to be higher than in Western patients . Therefore, postprandial glucose control is more important in Japanese patients with T2D. Also, postprandial insulin, C-peptide, glucagon, and triglyceride data support the mechanism of action of dulaglutide . In terms of insulin and C-peptide secretion, statistically significant increases in the mean changes from baseline in insulin AUC (0–4 h) and C-peptide AUC (0–4 h) at weeks 2 and 4 were observed for dulaglutide 0.75 mg compared with placebo. At week 1, the insulin increase was not as robust as at weeks 2 and 4; however, glucose levels were decreased by a similar magnitude at week 1 as at weeks 2 and 4. Gastric emptying effects of dulaglutide 0.75 mg might be one possible explanation for the reduced glucose levels at week 1. Indeed, it has been reported that GLP-1 delayed gastric emptying significantly after the first meal compared with the second meal . As for glucagon and triglycerides, there were no statistically significant differences in the mean changes from baseline in AUC (0–4 h) compared with placebo at any time point. Mean changes from baseline in glucagon AUC (0–4 h) after administration of dulaglutide were numerically greater than after administration of placebo; however, the differences were not statistically significant. In some patients, postprandial glucagon levels were not increased at week 0, making it difficult to demonstrate the effects of dulaglutide 0.75 mg.
Three of 12 patients experienced adverse events related to study drug during the study period; however, the severity of these events was mild. Also, no patients experienced symptomatic or asymptomatic hypoglycemia, defined as time in glucose concentration range < 70 mg/dl. Overall, there were no clinically significant safety or tolerability issues in this study, and the safety profile of dulaglutide 0.75 mg was similar to that observed in previous studies conducted in Japan [3, 6, 7, 8]. This study had some limitations. First, the sample size was calculated to detect differences between dulaglutide and placebo in the reduction of glucose AUC (0–4 h); therefore, due to interpatient variability, the sample size may have been insufficient to detect differences in changes from baseline in glucagon AUC (0–4 h) compared with placebo. Second, patients with relatively early stage disease, who are expected to have adequate insulin secretion ability, were enrolled in this study; hence, our findings may not be applicable to late-stage patients who have a decreased capacity to secrete insulin. In conclusion, we found that once-weekly dulaglutide 0.75 mg decreased postprandial glucose from week 1 through weeks 2 and 4 and also enhanced insulin secretion from week 2 in patients with T2D. These findings indicate that dulaglutide is associated with favorable PD effects soon after the initiation of treatment. Furthermore, there were no safety concerns in Japanese patients treated with dulaglutide in this study. The authors thank all patients involved in the study. This study was funded by Eli Lilly Japan K.K. (Kobe, Japan), which also funded the journal’s article processing charges. All authors had full access to all of the data in this study and take complete responsibility for the integrity of the data and accuracy of the data analysis. The authors thank Shiho Maeji (Eli Lilly Japan K.K.) for clinical operation support, Gina Moore (Syneos Health) for medical writing support, and Luke Carey (ProScribe—Envision Pharma Group) for editorial support. Medical writing and editorial support were funded by Eli Lilly Japan K.K. Megumi Inoue and Masanari Shiramoto declare no conflicts of interest. Tomonori Oura is an employee of Eli Lilly Japan K.K. Risa Nasu is an employee of Eli Lilly Japan K.K. Masako Nakano is an employee of Eli Lilly Japan K.K. Masakazu Takeuchi is an employee of Eli Lilly Japan K.K. The study protocol was approved by the Hakata Clinic Institutional Review Board. All procedures performed were in accordance with the ethical standards of the Hakata Clinic Institutional Review Board and with the 1964 Helsinki Declaration and its later amendments or comparable ethical standards. Informed consent was obtained from all individual participants included in the study. The data sets of the current study are not publicly available. Lilly provides access to the individual patient data from studies on approved medicines and indications as defined by the sponsor-specific information on http://clinicalstudydatarequest.com. Researchers need to have an approved research proposal submitted through http://clinicalstudydatarequest.com. Access to the data will be provided in a secure data sharing environment after signing a data sharing agreement.